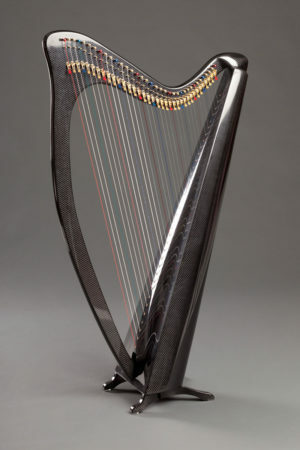 The most popular model, this full-sized 36-string lever harp weighs an astonishing 10.6 pounds. The harp has concert string spacing with a 5-octave range from C to C, and features a classic straight soundboard and a round (stave) back. It is designed to be leaned back on the shoulder, but is so light that it does not put any real weight on the shoulder. We offer the option of state-of-the-art LED lights installed under the neck on any of our carbon fiber lever harps. They’re specifically designed to shine down primarily on the strings and the players hands, rather than the whole area. The lights display the red, green, blue spectrum (and can also be set to white), with the ability to create 27 different shades. They also can be set to various levels of brightness, and 15 different transitional themes–including flashing, pulsing, strobing, etc. For more information and pictures visit our LED Lights page. We can install a Fishman single-transducer pickup in your harp. This will enable you to plug your harp into most amplifiers or amplification systems without using a microphone. Being amplified couldn’t be easier! We offer the Korg CA40 tuner, which works well with the harp. We supply it with a small clip pickup, so you can tune your harp even in a noisy room. Each string will be registered, along with an indication of how ‘in tune’ it is. Simply turn the tuning pin, using your tuning wrench, until the Korg CA40 tuner indicates that your harp is in tune.